The Department of Health (DOH) Central Visayas has asked municipal health officers to monitor water sources to make sure these have not been contaminated by damage wrought by Tropical Storm Seniang. Yesterday, 2 fires hit Metro Cebu, destroying 11 houses in Cebu City and damaging 1 in Lapu-Lapu City. Also yesterday, Capitol said it will be donating P1 million to the Sinulog Foundation for the holding of the country’s grandest festival. Pit senyor, indeed! The Manila Water consortium, which has a joint venture with the Cebu Provincial Government to pursue the Cebu Bulk Water Project, sent a mobile water treatment plant to Alcantara on Monday. That plant can transform murky stream water into potable water by 1,500 to 3,000 liters of per hour, according to a report by Sun.Star Cebu: Need for clean water urgent. Officials are worried damages caused by Seniang might include contamination of water sources. Mandaue City Disaster Risk Reduction and Management Office head Felix Suico said they have deployed a tanker to be filled with 50,000 to 75,000 liters of water in Moalboal for delivery to Ronda, which was badly damaged by Seniang. Cebu Provincial Disaster Risk Reduction and Management Office head Baltazar Tribunalo Jr. said that there are now four water treatment systems in place in the south. On top of that, Dr. Expedito Medalla of DOH-Central Visayas said he and his staff will be with other government officials to distribute 350 jerry cans in Sibonga, Dumanjug, Alcantara and Ronda. Each can hold up to 20 liters of water, he said. Start of classes brings, what else, heavy traffic! The first day of class after the Christmas break was peaceful but the sudden influx of vehicles caused heavy traffic, an official told The Freeman. Traffic Operations Management Operations Chief Jonathan Tumulak, however, told The Freeman they were able to manage the heavy traffic even during the peak hours. He particularly pointed out the Banilad-Talamban corridor as experiencing heavy traffic from 7 a.m. to 9 a.m.
“Tanan nag-expect na gyud nga ma-traffic ta kay ting klase na, ting-uli from the province, and ting-trabaho na,” — Cebu City Traffic Operations Management Operations Chief Jonathan Tumulak. 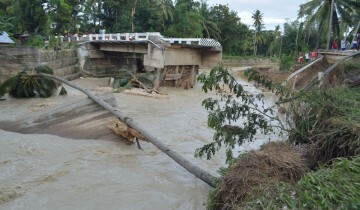 Public works officials said they are working to complete a temporary 2-lane steel bridge to reconnect Dumlog, Sibonga and Argao in 2 weeks. DPWH 7 Director Ador Canlas said the bridge panels are already at the site and the other components will be transported to Cebu from Cagayan de Oro City soon. “We hope we can reopen the bridge to traffic before the Sinulog celebration,” he said. 11 houses were destroyed in a fire at an interior portion of Barangay Capitol Site yesterday morning. Firefighters reportedly had a hard time getting to the scene because of a creek. The 20-minute fire caused an estimate P250,000 in damage to properties. The Freeman quoted Senior Fire Officer 3 Roylin Maratas as speculating that lighted candles children in the area were playing with may have started the fire. “Duna ta nadawat na information na magsige gyud ni sila og duwa og kandila. Kon biyaan ni sila sa ilang mga ginikanan,” — Senior Fire Officer 3 Roylin Maratas. Cebu-based Enrison Land Inc., the company behind the Be Resorts hotel brand, will be launching a business process outsourcing or BPO building this year in the IT Park. The company recently announced expansion plans for Be Resorts. “Cebu is growing fast and we’d like to be part of such strong growth.” — Managing Director Enrilen Joy Benedicto said. With the ASEAN integration, Cua says economic relations among member countries will be more prosperous.